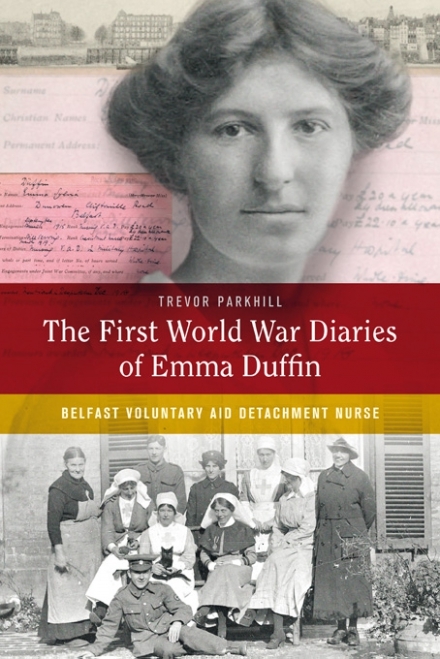 We are just beginning to explore the extent to which the First World War impacted on Irish women and to acknowledge the service given by those like Emma Duffin and her three sisters who were all Voluntary Aid Detachment Nurses (VADs) .Trevor Parkhill’s timely edited edition of Emma’s First World War diaries provides a remarkable account of one Belfast woman’s experience, first as a trainee in Egypt but then in France (mostly in Le Havre), from September 1915 until her demobilization early in 1919. Parkhill explains that the diaries may have been written immediately after, rather than during, the war. There are some clues that this is the case but, at points, details of particular moments may suggested that she expanded on briefer notes kept at the time. Of course, some of her experiences were so vivid that she must have carried them in her mind for ever, from the exotic bustle she described on arrival in Egypt, to her first experience of surgical cases in France – when she cut off mud-and-blood-soaked clothes, washed faces with ether soap, and cleaned pus and blood soaked splints (pp. 84-85) – to celebrations of the November 1918 Armistice (p.218-219) and a pilgrimage to Ypres, early in 1919 (pp. 228-229). There was a moment too, on a Le Havre quayside, when she saw an explosion at sea that was the torpedoing and loss of an incoming hospital ship (p.137). Parkhill provides useful biographical information and brief introductions to diary sections that correspond to Emma’s assignment to different hospitals. The daughter of a wealthy Unionist stockbroker, her maternal great-grandfather was United Irishman William Drennan. She was educated at Cheltenham Ladies College and spent a year as an au pair in Germany. A talented artist who became a book illustrator, some of her work is used in the book, like the great cartoon, ‘A VAD’s Nightmare’ (p. 195). Parkhill notes that the Duffin family valued education and social service and Emma’s strong sense of duty and level-headed acceptance of backbreaking and menial work is clear. There are points when she chooses the harder path, like when she rejects an easy posting to stay in a ward crammed with a hundred men ‘wounded fighting for us’ (p. 115). She describes how, in Alexandria, professional nurses (the ‘red caps’ or ‘regulars’) looked disapprovingly on VAD amateurs, yet Emma was given responsible work at an early stage. In France, VADs with her experience were recognised as assets. The diary provides sketches – some affectionate and some more critical – of large numbers of sisters, matrons, medical officers and orderlies, who brought varying attitudes and people-skills to their jobs. She frequently refers to Irish staff and there are little humorous moments like the description of an Irish Batman, Murphy, who claimed he joined the Royal Army Medical Corps (RAMC) because he thought the acronym stood for Royal Army Machine-gun Corps (p.139). The diary provides a sense of the constraints VADs faced, including confinement to base by 8.00pm when not on night duty. In Egypt, there were some invitations to visit ex-pat families but in France the impression is of little social life, long hours of duty and some periods of calm with the occasional concert party. Emma also notes that if they wished to ‘remain in good odour with the powers that be, [VADs] would do well to be very circumspect with officer patients’ (p.110). We learn of her frustrations, including that she could find herself posted from centre to centre without warning and ‘treated like a piece of furniture’. She noted: ‘All through my army career I felt that if I could only make myself realise that I was only a pawn in this game, if I could bury my ‘self’ I would be much happier …’ (p.127). Of course, there were times when she was ‘heartily sick of horrid sights and smells’ (p.110). Nursing staff faced the same threats as troops when travelling by sea or in areas subject to bombardment or air-raid, something she experienced in the latter stages of her service (pp.208-213). Particularly when overworked and run-down, nurses risked infection but this reader had not realised that they could develop burn-like symptoms from contact with the clothing of gassed men (p. 185). Descriptions of places Emma worked bring home the scale of the problems medical staff dealt with and how rough and ready conditions could be when waves of convoys arrived. At La Gare, in Le Havre, the hospital was in the railway station. Below it trains disgorged the wounded for treatment and ships came alongside to take off patients recovered sufficiently to travel (p. 83). At the’ Southampton shed’, a quayside ‘hangar’, men with their ‘Blighty tickets’, many of them amputees, waited for transport and we see that the ticket was no guarantee of making it home quickly or alive. Emma recorded visits of a small number of relatives of the wounded (including a woman with her baby) and she recounts how one mother collapsed on the floor as her son died. Later, clutching Emma’s hand she wept: ‘Oh my boy, my boy, no country was ever worth it’ (p.116-117). Emma remarked on how nurses became so accustomed to death that ‘without being in the least heartless, one can sit by a patient till he dies, and yet laugh and chat off duty, just the same’ (p.91). Emma Duffin does seem to have been an exceptionally capable woman, though nothing in the diaries suggests she saw herself as such. It is Parkhill, not Emma, who tells us she was mentioned in dispatches, and he notes that during the Second World War she was head-hunted to command the VAD base at a Belfast military hospital. The publication of these diaries, however, provides an accessible source that brings home how much not only Emma but also those she worked with gave of their prime years (she was aged 31 when she enlisted), and how much they must have carried on their young shoulders during – and on their minds after – the war. Parkhill has done an excellent job in bringing their experiences to a wider audience.